‘Demagogic’ populism does not help cause of peace. The pope invoked Egypt’s “glorious history” as an ancient cradle of civilization to argue on Friday that the delivery of a more peaceful future required a new civility that appreciated differences, resisted the violent path of close-minded absolutism and condemned extremists who camouflage terror in religious language. 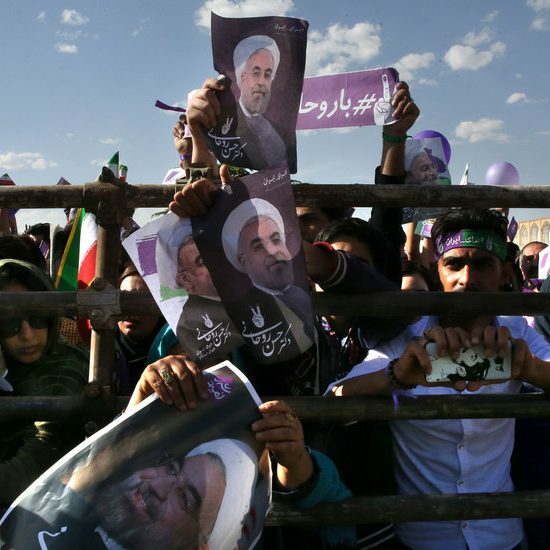 In a decentralized Muslim world, the pope’s speech and his continuation of a dialogue with Sheikh Tayeb provided Muslims with a high-profile counterpoint to the radical language coming from extremists. Al Azhar forms many of the Sunni world’s imams and oversees the education of millions of Egyptian children and college students. Francis during his flight to Cairo. “We have an obligation to denounce violations of human dignity and human rights,” he said. During his speech, Francis made a reference to St. Francis of Assisi and his visiting of Sultan al-Kamil of Egypt to promote civility even as crusaders sought to gain control of the Nile. 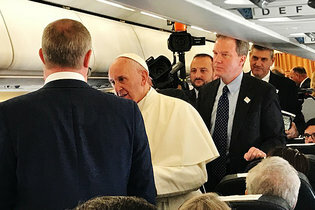 Alberto Melloni, the director of a liberal Catholic research institution, the John XXIII Foundation for Religious Studies in Bologna, said that in the days leading up to the speech, Francis repeatedly made reference to the saint’s visit centuries ago and saw his own mission in a similar vein. “Saint Francis asked for his brothers nothing but the possibility to live amongst them,” said Mr. Melloni, arguing that the pope was essentially asking the same of Sheikh Tayeb. 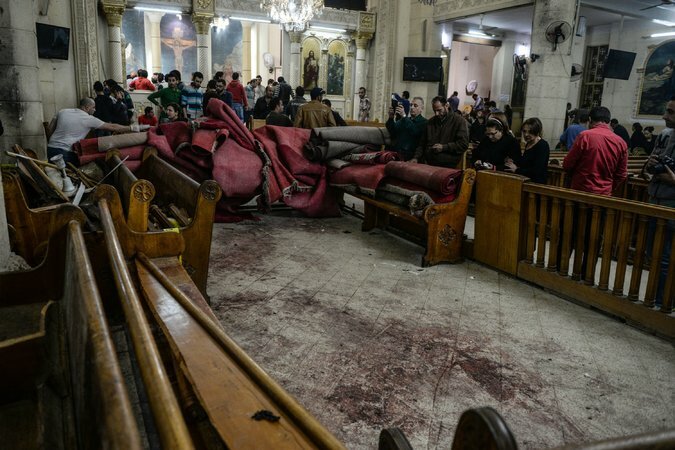 St. George’s church in Tanta, Egypt, was one of two Coptic Christian churches attacked on Palm Sunday. Francis prods Sisi on human rights. In an address to President Abdel Fattah el-Sisi and a collection of political and civil authorities, Pope Francis gently sought to encourage the authoritarian government’s progress in protecting Egypt’s religious minorities while at the same time making subtle, diplomatic but nevertheless clear allusions to the leader’s crackdown on human rights. 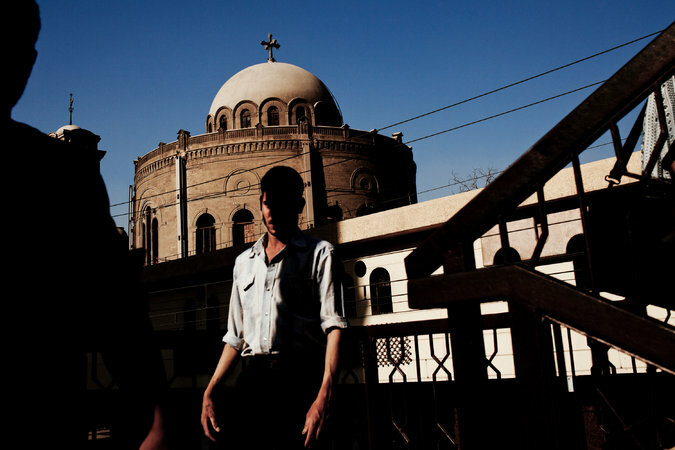 A Coptic church in Cairo. An estimated 10 percent of Egypt’s population is Christian, nearly all of whom belong to the Coptic Orthodox Church. In the early centuries of Christianity, Egypt had a Christian majority. But in the 20th century, the collapse of the Ottoman Empire, two world wars and the rise of the Pan-Arab nationalist Gamal Abdel Nasser contributed to an environment in which some Coptic Orthodox Christians felt endangered and began to leave. Egypt, a country of about 90 million, is overwhelmingly Sunni Muslim today. An estimated 10 percent of the population is Christian, nearly all of whom belong to the Coptic Orthodox Church. A vast majority of the Jewish community, who once numbered in the tens of thousands, left in the mid-20th century. Muslims and Christians live peacefully in much of Egypt, and the country’s richest family, headed by a telecommunications magnate, Naguib Sawiris, is Orthodox Christian. But an ugly strain of sectarian prejudice runs though society, backed by discriminatory laws, which has at times led to violence. 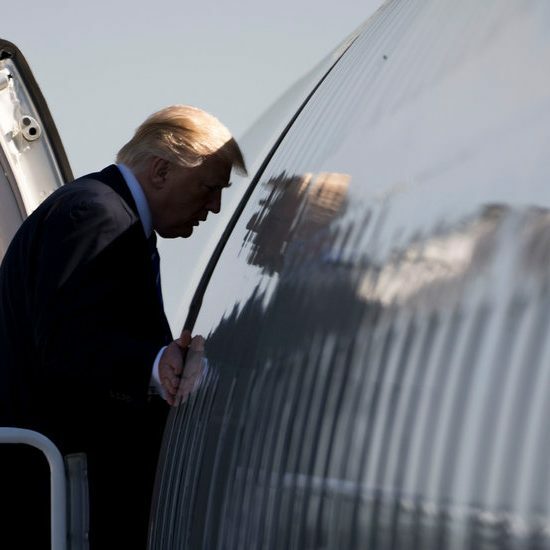 The worst trouble tends to occur in rural areas with large Christian populations, where Muslim mobs burned homes and attacked Christians as recently as last month. Christians complain that, when clashes occur, officials nearly always side with Muslims. More worrying still is the specter of attacks by militants. 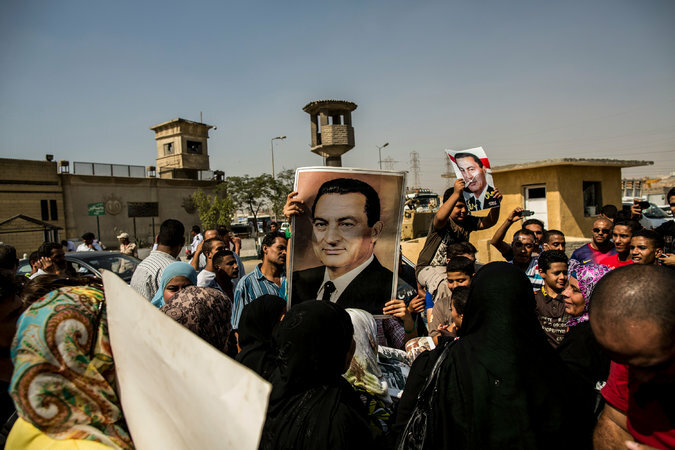 Supporters of the deposed Egyptian president Hosni Mubarak outside Torah Prison, where he was being held, in 2013. The current president, Abdel Fattah el-Sisi, has portrayed himself as a protector of Egyptian Christians. After the Arab Spring, Christians pressed for a secular, democratic state that would better protect minority rights. Many saw the rise of the Muslim Brotherhood and Salafists as an ominous turn and were openly relieved by the military takeover that removed the Muslim Brotherhood leader Mohamed Morsi from power in 2013. Mr. Sisi, who removed the Muslim Brotherhood from power, has pleased some in the Vatican with his efforts to better safeguard the rights of the Christian minority, though many remain troubled by his crackdowns on the Brotherhood and other political enemies. The bombings this month — and oppressive laws barring Christian converts from changing their religious affiliation on identity documents, and imposing stiff restrictions on church building — showed that Egypt is still a trying place for Christians to live. University students waiting to hear Sheikh Ahmed el-Tayeb, the grand imam of Al Azhar mosque, speak in Cairo in 2015. The pope will attend a peace conference hosted by the sheikh while in Egypt. The role of Al Azhar. Perhaps most important, Mr. Sisi’s government has slowly removed extremist ideology from school books. But when it comes to Islamic formation, it is Al Azhar University, perhaps the most influential center of Sunni Muslim learning in the world, that is crucial. The university has said it would reassess the language in its textbooks and has made improvements, according to the religious freedom report. In May, its grand sheikh visited Francis in the Vatican, a visit the pope is reciprocating with his appearance at a conference on peace organized by the university on Friday. 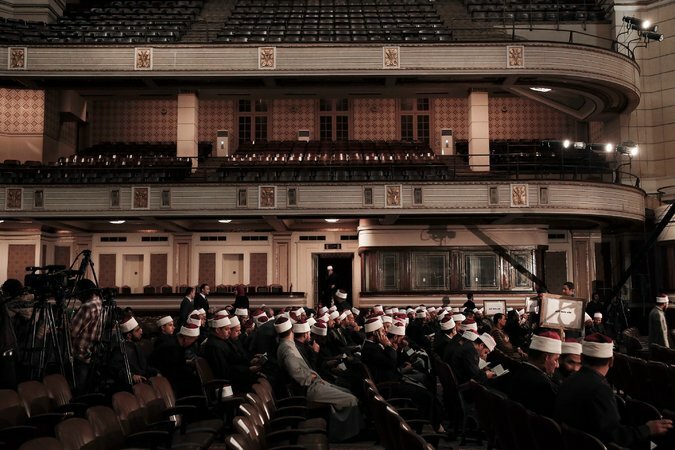 Al Azhar trains a vast number of the Muslim world’s imams and has oversight over more than two million children and an additional 400,000 university students around the country. Mr. Sisi’s government, which has tightened its grip on Muslim religious institutions, funds Al Azhar and pays the salaries of many clerics. Mr. Sisi’s efforts to exert tight control over the affairs of Al Azhar are resented by many clerics, and have been a source of some tension.